Every last Friday in April, Arbor Day is celebrated in the US. This day reminds us on how important trees and forests are for our lives. All over the world people are planting trees on Arbor Day … which is a different date in most countries. In Germany it is always on April 25. 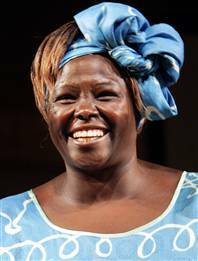 On Arbor Day, we also remember Wangari Maathai, Nobel Peace Prize Laureate from Kenya. Tirelessly, she stood up for environment protection, democracy and human rights, especially women’s rights. In 1977, she founded the Green Belt Movement and showed with her work, that planting trees is a political statement. And today, we also show how tobacco is linked to trees and forests. Watch this video from Canada to get a one-minute overview. This video was produced in 2013 by concerned youth from South West Ontario, Canada. One minute of facts leaving no doubt that environmentalists have good reason not to smoke.